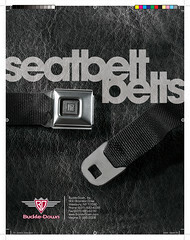 We just finished the design of Buckle Down’s 2008/2009 Seatbelt Belt Catalog. 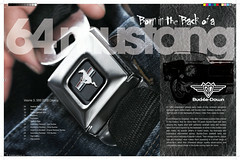 Buckle Down takes real seatbelts out of real cars, then turns them into belt buckles for the likes of you and me. The challenge of creating this catalog was that the product’s timeline and budget didn’t allow for shooting with models. So, instead of having a model establish the catalog’s personality, we let the products do it for themselves. 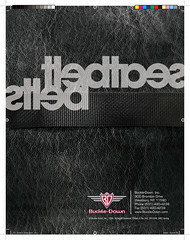 The catalog’s color pallate, textures, graphics, typography and text all communicate the authetntic, gritty and automotive feel of Buckledown’s Seatbelt belts. Model shoots can make communicating a product’s personality easy, but this catalog proves that easy isn’t awlays better. Head over to our flickr gallery to see a few more spreads from the catalog.